Control the electronic ignition of your gas powered aircraft via your transmitter. The ignition switch 3 has been developed for turning on and off electronic ignitions in gasoline engines by remote control. It is suitable for all gasoline engines with battery-powered ignition systems. The ignition switch 3 is microprocessor controlled and utilizes an optocoupler that separates the receiver & ignition circuits. The ignition switch 3 can be operated in parallel to the throttle servo if an addition receiver channel is not available. In this configuration, the ignition switch 3 is connected directly to a servo plug, which in turn is connected to the throttle servo. By adjusting the switching point and switching direction, it is now possible to set the ignition to switch off when the throttle trim is reset during idling or by switching the throttle channel with an additional mix. The circuit has several fail-safe features that ensure that the ignition is switched off safely during emergencies. For example, the ignition can be set to switch off if the transmitter signal has not been received for three seconds. When switched off, the ignition switch 3 consumes no power from the ignition battery. The plug connection to the ignition battery therefore only has to be disconnected for charging. The ignition battery may also remain connected to the ignition switch 3 when charging, if it is charged via a separate charge cable. 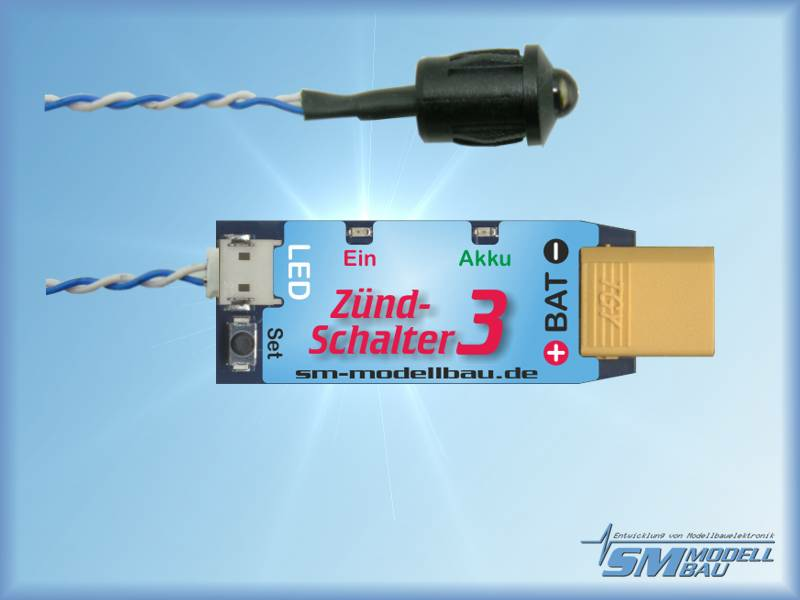 A replacement LED indicator is available separately if needed, see the related products link below.